A new profile on Tim Cook done by the New York Times has shared a variety of details discussing the Apple CEO's leadership style over his nearly three year tenure as the head of the company, including his influence on product development, brand expansion, and "quiet" approach to design. The profile also sheds new light on the development of Apple's highly-rumored "iWatch" smartwatch. The report notes Cook's differences in management compared to Apple's late co-founder Steve Jobs, sharing how the CEO has made key decisions to release unique new products and acquire new talent over the past few years. Moreover, his attempts to broaden Apple's brand by expressing support for initiatives such as environmentalism and charitable giving were also highlighted. A number of Cook's peers spoke on Apple's pressure to deliver another breakthrough product, with Apple design chief Jony Ive saying that Cook has "not neglected" the company's central mission of "innovation," noting that it has been "hard" for the company and its CEO to "be patient." Honestly, I don’t think anything’s changed,” he said. And that includes the clamor for some exciting new thing. “People felt exactly the same way when we were working on the iPhone,” Mr. Ive added. New details were also shared on Cook's influence on the iWatch, with the report noting Cook has been "less involved" in the direct engineering of the device, delegating the hands-on roles to other executives such as Ive. Cook is said to be interested in the smartwatch's "broader implications", taking an interest as to how the device could help people monitor their health more efficiently. Sources said that the iWatch is expected to launch in the fourth quarter of this year, which is in line with previous reports. Cook has also managed to acquire new personnel throughout the past few years, hiring personnel such as former Burberry chief Angela Ahrendts to head Apple's retail efforts and former Yves Saint Laurent CEO Paul Deneve to lead "special projects." U2 lead singer Bono, who worked closely with Apple through the (Product) RED initiative, says that Cook is amassing a "creative brain trust," adding that Apple's acquisition of Beats Electronics was done to expand the company's creative perspective in the absence of Jobs. Since he took over, the company has released a number of upgrades, including a smaller tablet, the iPad Mini. Mr. Cook “thought the world would love a smaller and less expensive tablet,” said Robert A. Iger, the chief executive of Disney and a member of Apple’s board. It was a product that Mr. Jobs thought did not have a market, he said. The profile finally speaks on Cook's approachability as told by developers and employees at the company, highlighting the CEO's ability to hold conversation and express his activism and perspectives. 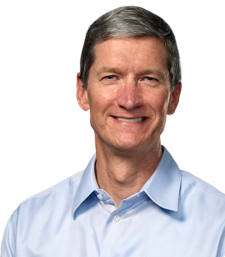 Overall, while Apple has experienced criticism amid slowing revenue growth and the lack of drastic product expansion, the profile notes that Cook has gained a considerable amount of influence throughout his tenure as CEO. Apple is expected to launch a variety of new products this year, including bigger iPhones, a new Apple TV, and refined iPads, as well as new MacBooks and an upgraded iMac in addition to the aforementioned iWatch. Steve Jobs is dead. Not sure if some of you are aware of that. Tim Cook didn't steal Apple away from Jobs, so it's pointless to keep saying that "Cook is no Jobs". Though I'd point out that he's aware of that, which is why they're busy assembling a "creative brain trust". Jobs was a visionary. He saw where technology would be in 5-10 years down the road. Tim Cook is no Steve Jobs! Cook knows that he is no Steve Jobs, thats why he is hiring creative talent. Knowing what you can't do is just as important as knowing what you are good at. In that regard he is doing a great job so far. IMHO, comparing people is silly. Saying Jobs was "one of a kind" and then expecting someone else to be like him is even more silly. Apparently, Cook is aware of his strengths and weaknesses. He is certainly better than Jobs in analysing the market in an unbiased fashion. Recent hires and acquisitions, as mentioned in the article, is a try towards feeding the company's hunger for creativity. Time will tell how all of this will work out but for the time being, Cook is a really good successor. Tim Cook is no Steve Jobs. Jobs was an innovator who created things that Microsoft and Google copied (example: Mac OS and iOS). Cook is a follower who copies Microsoft and Google (example: flat design). Right, like how Jobs created the MP3 player, the smartphone, and the tablet. Innovation doesn't mean creating something new, it means doing something better in a way that has a significant impact on society. I'm not surprised the New York Times' profile gave TC a fairly good review, with little to no criticism, and most of those interviewed, giving positive feedback about the 'new' CEO. Tim has so far done an admirable job, under very challenging conditions, imho. Is his management style different? Absolutely. But that may turn out to be a good thing. Yes, and Jobs was no Cook. Without Cook ability to optimize processes, expenses, making Apple an efficent machine, closing strategic deals for components, complety revolutionizing the distribution chain probably many of today successful Apple products would have had the destiny of the Cube and similar Job's revolutionary new ideas. If you're going to call someone out at least back it up. Else it's just hot air. No not really. You're just pontificating. By spewing your own clearly unobjective idealised views based on your cult hero which, sidenote, he's dead...been dead for 3yrs. How people haven't made their peace with this i don't know. Apple has gone mainstream? If you don't evolve with the times as a company you will either stumble or die out. Don't believe me? ask RIM (http://www.theverge.com/2012/2/21/2789676/rim-blackberry-mike-lazaridis-jim-balsillie-lost-empire), Nokia (http://www.theinquirer.net/inquirer/news/1635299/nokia-admits-losing-ground), Palm (http://www.theverge.com/2012/6/5/3062611/palm-webos-hp-inside-story-pre-postmortem) etc. I'm reminded of people crying about the fact that Apple switched to Intel processors, seeing it as a 'mainstream' move and 'selling out'. Yet it is because of that decision to move to x86 that the Mac line continues to thrive today. Jobs famously was against bringing iTunes and the store to Windows. iTunes for Windows is the reason Apple sold so many iPods and sells so many iDevices to-date. Jobs also was against a mini tablet, yet the mini is one of the reasons Apple rakes in billions today. Jobs didn't get everything right. *gasp* shocking i know. Then you say Tim Cook copied Jobs's style which i just found comical. We're now down to clothes? really? But let me humour you. Lets ignore the fact that the casual style is a general culture at Apple (http://www.macthai.com/wp-content/uploads/2013/01/steve-jobs-team-jony-ive-scott-forstall-eddy-cue-phil-schiller.jpeg) thats not down to just two men. Last i checked Jobs largely wore crew/turtleneck sweaters, jeans and sneakers. Cook has worn shirts (http://static3.businessinsider.com/image/523228d0eab8ea622b966702/i-am-also-an-apple-shareholder-and-i-have-also-written-a-letter-to-tim-cook.jpg), blazers (http://www.technocrates.org/wp-content/uploads/2013/09/Tim-Cook-5C.jpg) and even suits (http://static.ibnlive.in.com/ibnlive/pix/sitepix/05_2013/apple-tim-cook-290513.jpg). But i suppose both wear glasses so Cook must've copied that. Lets also not forget that Jobs picked Cook personally to succeed him. And if Jobs is as legendary as you claim then he surely wouldn't have made such a decision lightly. Steve Jobs also touted the so-called checklists you're talking about. Every presentation talked about how green their stuff were. Oh and surprise surprise Jobs was also charitable albeit privately (http://appleinsider.com/articles/13/05/24/steve-jobss-family-has-been-giving-money-away-anonymously-for-more-than-2-decades).